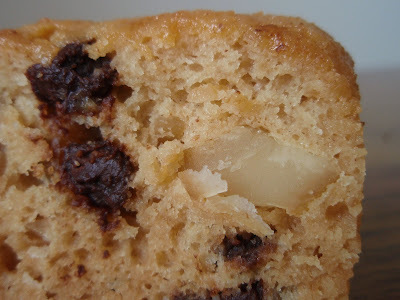 Grace, you are really going too far ~ Sourdough bread and chocolate! Two of my favorites things... all you need to add now is a slice of sharp cheddar cheese and I am in paradise. Now I just have to get your 'starter kit' and I am on my way. I am a definite chocolate lover. True, white chocolate is more candy than chocolate, but hey, there is cacao butter in there so technically it's still chocolate, and your praise suits me fine!! White chocolate is also a perfect complement to matcha! That bread looks great! I also love chocolate, any way, shape, or form. This bread looks heavenly! I love macadamia nuts! That bread looks really scrumptious! girl you are the bestest choco-creator-come-upeth-new-recipes!!!!!!!!!!!! I would NEVER EVER ignore white chocolate!!! Nice! I would totally throw down on this, for breakfast or dessert or a snack, anytime. I should stop reading your blog, becuase it just makes me want to eat. But I won't! This looks yummy, and fairy simple to make! I might make it while we wait for the man to alue our flat of Friday, it might get us a better price! I love the name - so fun and playful! I love how many sweet things you make with Eb. It gives me hopes that one day I can do a sourdough starter. At the moment though, I find it difficult to remember to water house plants with any sort of regularity. White chocolate is my absolute love. Other than that it's carob (which always gets an 'ew' from most folks). After an incident with exploding sourdough starter in my youth, I avoid yeast. Your bread looks great, however! I happen to be a chocoholic, although I can't eat white chocolate on its own. I can eat it in other things, but milk and semi sweet chocolate are my true poison. I'm not sure about the name thing. While white chocolate doesn't have any chocolate liquor in it it does contain cocoa butter and milk solid much like milk chocolate. So it's chocolate in my book. The bread looks terrific. I now wish I hadn't given away the last of my starter. White chocolate and raspberry cheesecake sounds divine - so does your whacadamia nut bread! You are so creative. Love the whacadamia nut bread. And I too love all forms of chocolate...even the white. I knew where that was going when I saw the photo, sounds freaking amazing! I don't eat chocolate flavored foods (like brownies), but I have rarely been known to refuse real chocolate. I believe it's part of the girl code of life that you must eat and enjoy chocolate if you aren't allergic to it. Whoa! Nothing I don't love about this bread! Chocolate, gooey and salty/crunchy. And where on earth did you find instant white chocolate pudding mix? Lord, I have GOT to start looking for something other than orange sugarless jello! And the name is a hoot. Leave it to you! I'm with you, all chocolate is good. I really love the white chocolate/macadamia combination! Add dried cherries into the mix and it's one of my favorite kinds of cookies! Everything about this bread sounds fantastic...I love a salty crunch with my chocolate (oooh, reminds me of chocolate-covered pretzels!). I'm a big fan of white chocolate, and with macadamia nuts, it's perfection. Excellent name for this too! I love a good white choco-macadamia nut cookie. bread sounds even better.. I love the name! Thats sells it for me. and white chocolate is a prized possesion in our house hold since my mum is allergic to chocolate, white chocolate is the closest thing to it she can eat. This pudding bread looks greta, you have done it again. I love white chocolate macadamia nut combination - this bread sounds super delicious! I'm drooling and so wishing I had some sour dough starter so I could make some. Thats looks so darned good. and I just finished dinner....the kids ate all the brownies I made the other night and I have nothing...not even your Whacadamia Nut Bread. life just isn't fair!!! Gotta love the name! No, I don't think anything goes with macadamia nuts like white chocolate does...though sweet potatoes might be a close second. :-) A beautiful bread and another great sourdough creation! *raises hand shyly* Erm, I'm one of those who "beats up" white chocolate for eating, but I bake with it extensively, go figure :). You are so inpsiring me to try and grow my own Ed. Loved getting to know a bit more about you over at the Pond. Btw - fantastic name for a bread, so whacky! 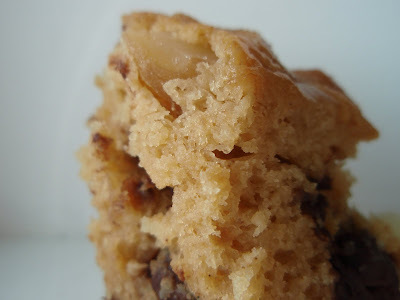 Macadamia nuts win me over too...and your ever-moist cake. No such thing as bad chocolate, total agreement sister!! This sounds wonderful, I love the name of your dish and I too love Blond Duck, how did I miss your interview, clicking over now..
Great interview on A Duck in her Pond! Wow! You are a baking genius! This bread sounds so good. I would be snacking on it all day. I love them all and my fav is white! Oh geez, this would be heaven. White chocolate pairings are made in heaven I agree, there's nothing like em'. oh wow!! this sound heavenly delicious!! cant take my eyes of ye pic! yummm!! While I am not a fan of white chocolate, I do agree that sometimes it is the best pairing. This looks and sounds like something I could easily get used to eating ;). Another great post, Grace! Mmmm, I could use a piece of that right about now, with a cup of hot tea. Nom, nom, nom... oh wait, I'm just imagining myself noshing on your eb-worthy bread. Nice work! Alright there are two things that I can't eat. Coconut shavings I hate the texture more than anything they have to be fried at least. and white chocolate I have never had a decent white chocolate experience to me it taste like...alright not going there. But after looking at your recipe you have inspired me to give it one more shot! I love all of the chocolates mixed together! Oh my- I love this morsel of whacadamia. Almost like wacky acadamia- though much tastier. he he. I love this Grace! This sounds so moist and sweet. 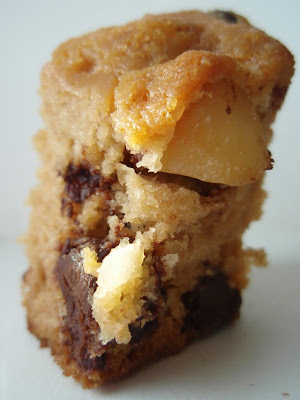 A great variation from the usual macadamia and white chocolate chip cookie. I love desserts that are a little bit different from the usual. Your tower of bread is especially delicious looking. I agree - white chocolate pairs perfectly with macadamia nuts. Now send a slice of this bread my way!! Wow, that looks delicious. The crumb is perfect! Did you make your sourdough starter? I'm curious to hear about it if you did! I'm also an equal opportunity eater when it comes to chocolate. Yum. I really enjoyed your interview! I'm with you too - I'll eat any kind of chocolate. This looks great! I would love a piece of this! Calling it bread makes me feel like I can eat it anytime. ;) I like all the types of chocolate including white chocolate. I think I love best when milk, dark and white are all mixed together in something like this. When I read your entry about using a sour dough starter for your oreo pudding I was intrigued. Now I am doubly intrigued! I really will have to spend some quality time in the kitchen over christmas break and try some of these out. The hubs is nuts for macadmias. I'm so clever aren't I? Ah ha ha. This sounds delicious!